Episode 10 of Inside BU Hockey features Bernie Corbett’s interviews with Coach David Quinn, sophomore defenseman Brandon Fortunato and former Terrier assistant coach--and current L.A. Kings amateur scout--Bob Crocker. Fortunato, who was named this week to the US Junior National Team training camp roster, has 14 points (4G, 10A) which has him tied for third on the Terriers and second among NCAA defensemen in scoring. Two of his goals have been game-winners and he has quadrupled his goal total from last season. 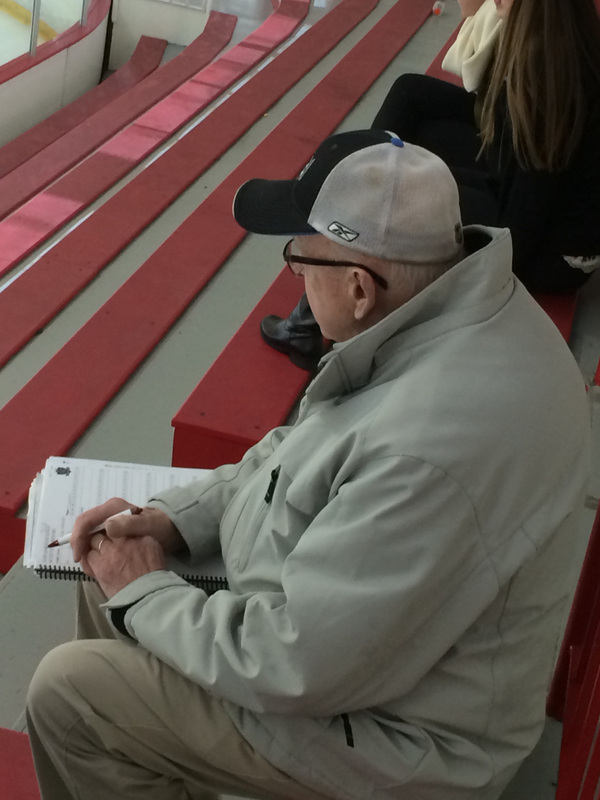 The “Dean of New England Scouts,” Crocker, who served as Jack Kelley's assistant for ten seasons, will receive the Lester Patrick Award for service to U.S. hockey at the U.S. Hockey Hall of Fame induction dinner on Dec. 17. 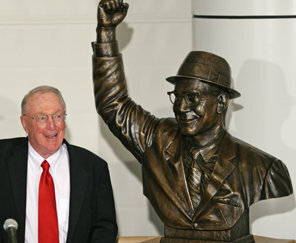 (see yesterday’s blog post for more details on Crocker and the Hall of Fame induction event). BU Terriers All Access, “a new show dedicated to Boston University men's ice hockey, “will be featured on NESN, with the initial airing tonight (Dec. 10) at 7 p.m. Future air dates are 12/11 at 9 p.m. and 12/20 at 3 p.m. The program will also be made available online. 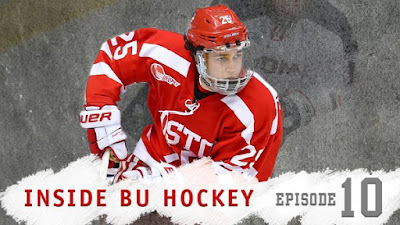 The first episode focuses on the Red Hot Hockey game and New York City trip, along with features on Captain Matt Grzelcyk and assistant coach Scott Young. Legendary BU head coach Jack Kelley was honored on December 4 at Colby College where the head coaching job has been endowed as the Jack Kelley Head Coach for Colby Men’s Hockey. Kelley, now 88, dropped the ceremonial first puck in the Mules game against arch-rival Bowdoin, a game won by Colby, 3-0. Kelley coached at Colby from 1955 through 1962 before beginning a decade behind the Terrier bench that resulted in a 206-80-8 record (.720 winning percentage) and culminated in BU’s first two national championship seasons, 1971 and 1972. After serving as coach and general manager of the New England Whalers, Kelley returned to Colby for one final season, 1976-77 and achieved his 300th career win in a victory over Division 1 Northeastern. 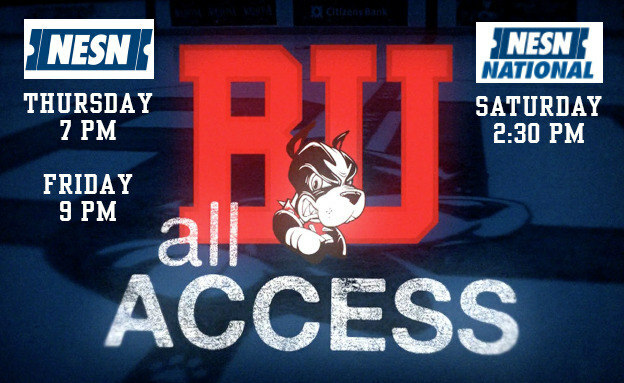 Colby’s current coach is former BU assistant coach and Lowell head coach Blaise MacDonald. 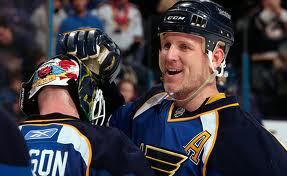 ►TheHockeyWriters.com debate the Hall of Fame credentials of former Terrier Keith Tkachuk. 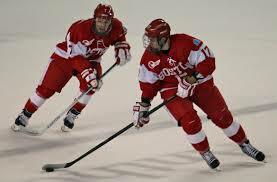 The Melrose native played for BU’s 1991 national finalist squad, scoring 40 points before beginning a long NHL career in which he tallied 1065 points in 1201 regular-season games. His son, Brady Tkachuk, is a 2017 Terrier recruit currently skating for the USNDTP U17s..
►Former Terrier Evan Rodrigues (photo, right) scored his third goal in the last six games in Rochester’s 4-3 shootout loss to Utica. After a slow start, Rodrigues now has seven points for the Americans. ►Twenty games into his first professional season, Cason Hohmann (photo, left) leads the ECHL Elmira Jackals in scoring with a 10-11-21 scoring line. 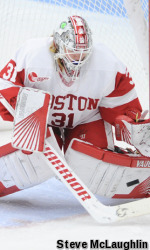 ► Former Terrier defenseman Kaleigh Fratkin is thriving with the NWHL Connecticut Whale .